Space Rogues 4 is proceeding nicely. Slower than i expected, but it’s a more complex story. This book shows the crew’s strengths in different ways. Showing that while they’re stronger together they’re also forces to be reckoned with singly and in smaller groups. “So, which one can you fly?” Bennie asks Maxim, looking from the fighter deck below to the big Palorian kneeling next to him. They’re crouching in one of the larger air ducts near the top most section of the multi deck hangar facility. 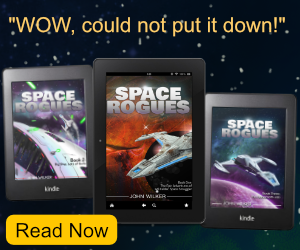 “Uh, well, none.” Before Bennie can reply, he adds, “I was never a fighter pilot, but that,” he points to a craft, larger than the strike fighters that litter the deck of the hangar. “What the wurrin is that?” Bennie asks, holding his wristcomm up to let the camera zoom in on the craft, nearly twice the size of the fighters around it. “Sounds fast.” Bennie says, the sarcasm dripping from his reply. While you’re patiently waiting for Space Rogues 4: The Horror Story Job, what’re you reading now? I’m reading ‘Stormhaven Rising‘ By Eric Michael Craig. It’s a techno-thriller-scifi tale that so far is pretty interesting. It’s a slow burn in the style of Kim Stanley Robinson, so if you love those books, give Eric a shot.